Sarah A. writes — I just got a new puppy, and would love your advice! I’d love to teach my puppy to stop eating everything. She seems to want to eat every single thing she finds outside. I keep having to take things from her mouth so she doesn’t choke or puncture something or ingest large amounts of grass. When I can get a treat out of my hip bag fast enough, I replace the object with a treat, so she won’t have such a negative association with me taking stuff from her. But even still, she resists a bit, and I would rather she not eat the stuff on the first place. But I also struggle to get her attention in a way that will still allow her to calm down and go to the bathroom when we go outside. Do you have any advice on teaching a puppy to stop eating everything? Oh, the joy of young puppies. You’re trying to do potty training right, so you’re constantly going outside with a pocketful of treats. But your pup would rather eat grass, wrappers, bugs, twigs, or even rocks than go potty and get her treat! How do you teach a puppy to stop eating everything? Sarah is already doing a great job by bringing treats on the walks. She’s able to distract her puppy from inedible things and then reward her for complying. But there are plenty more tricks to try to help teach her puppy to stop eating everything. Work on drop it, leave it, and exchange games. Both “drop it” and “leave it” are great skills for all dogs to know. They truly are lifesaving in some situations. Less dramatically, they’re the best way to puppy to stop eating everything. An exchange game is a game in which your dog learns to trade what he’s got for what you’ve got. This is useful in teaching him to drop grass/twigs/sticks in exchange for a treat. There are lots of great YouTube videos on how to teach each of these skills. In practicality on walks, this means carrying really tasty treats (cubed ham, hot dog, or lunch meat are all good places to start). Your pup will soon realize that it’s a great idea to listen to Mom! Today Barley and I went for a 4-mile jog. As we ran down the sidewalk under a bridge in a dingy area, we came up towards an open box of pizza. I called out “leave it!” and Barley continued to run past. If he only knew “drop it,” I’d have to get him to spit out some tasty pizza. That’s harder than just not eating the pizza in the first place. I also avoided any potential danger of toxins or whatever else is coating gross pizza on the ground. Later on the same run, he picked up a stick. That’s fine. But as he started running looking to me, tripping over himself as he tried to get me to throw the stick, I decided that he needed to stop carrying the stick and focus on our run. So I cued him to “drop it,” and he did so. It’s not a big deal for him to pick up a stick, so he didn’t need to “leave it.” But eventually I wanted him to spit it out, so I asked him to. This distinction isn’t always as important. If you only teach one, I’d teach “leave it.” It’s easier to ask your dog to ignore something than it is to ask your dog to spit something tasty out! We’ve already touched on two of my favorite impulse control games. While “it’s your choice” and exchange games are great, there’s much more to try! Impulse control is a fantastic skill for dogs to have. It sounds like your puppy is acting on her most basic impulses to explore the world with her mouth, then eats everything she finds. This isn’t uncommon. Increase her exercise and enrichment elsewhere. Puppies need a lot of potty breaks, which means a lot of time outside. There are a lot of things to eat outside. You can’t just stop walking her or only take her places that are perfectly clean of potential snacks. Instead, you can try to increase her exercise and enrichment outside of potty breaks. A wide variety of exercises like flirt poles, impulse control games, nosework, agility, shaping and training games, tug of war, and fetch is a great place to start. Don’t forget to throw in some enrichment in the form of puzzle toys. Relaxation work and nosework are a must-do for high energy dogs as well. Help wear her out. Tired dogs are less naughty. Give her fewer opportunities to eat things by playing more games inside. Educate her by playing games that teach skills. 4. Make paying attention to you on walks WAY more fun than eating things. Get better treats. If kibble doesn’t work, try hot dogs. Hot dogs aren’t good enough? Try steak. Or cheese. Try anything. If nothing is helping, the environment is too challenging for your dog. It might be that you’re doing the dog equivalent of asking a 6-year-old to do algebra while at a waterpark. See #3. Increase your “rate of reinforcement.” Give more treats, basically. When I first start teaching dogs that pull on leash to walk politely, they get a click-and-treat for every. Single. Step. It’s exhausting, fast-paced, and intense. But it helps keep your dog really focused, and you won’t have to do it for long before you can start decreasing how often you doll out the cookies. Make the task easier. Many dogs ignore that leftover pizza on the ground. It takes time to build up the impulse control (see? Told you it was important!) and focus to ignore tasty snacks all over the place. Be patient and don’t sweat it if you have some setbacks. Maybe your pup loves pinecones. Don’t take her to a pine forest just yet – stay away from the tempting things until you’re sure she can handle it. A Note on Nutrition: Sometimes, puppies eat everything in site because their stomach hurts. This can be a symptom of allergies. 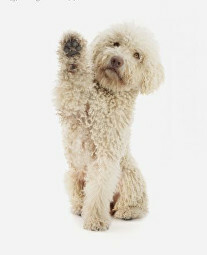 Consider giving your dog specially formulated foods for dogs with allergies. 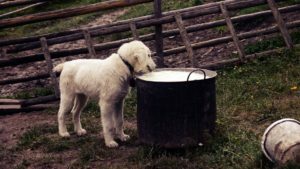 You might just fix the problem by changing what you feed your dog! Last-ditch efforts: it’s possible, though unlikely, that Sarah’s puppy suffers from Pica. This is an ill-understood disorder that results in the compulsive eating of inedible things. It’s unlikely due to the puppy’s age – many puppies just eat everything they can get their mouths on because they’re puppies. But if it turns out that Sarah’s puppy never grows out of this, it’s time to get more help. Muzzle training is a good place to start for dogs with Pica because it keeps food out of their mouths. Hopefully, it doesn’t get to that point! It’s ok. Your puppy will get ahold of some disgusting dead fish, or a pinecone, or a pizza slice. If you feel comfortable, use your finger as a hook to remove things from your dog’s mouth. It’s important to praise heavily afterward. Ideally, you’ll then give your dog a bunch of treats or a good round of playtime. This will help keep her comfortable with your hands near her mouth. If you tackle her to remove tasty things too often, and she’ll start being suspicious of you! In some cases, it also might be ok to just let it slide. Just a few weeks ago, Barley got a mouthful of shredded sweet potato as we walked down the street. I have no idea why there was an open box of shredded sweet potato on the sidewalk, but that’s a mystery for another day. I asked him to drop it and he lifted his head, leaving the rest of the box with just a bit of food in his mouth. By the time I tried to clean it out with my finger, he’d already swallowed. I sighed, hoped it wasn’t rancid, and we moved on. It’s ok. He was fine. (Don’t do this if what your dog ate is dangerous – in that case, get professional help to remove the object medically). 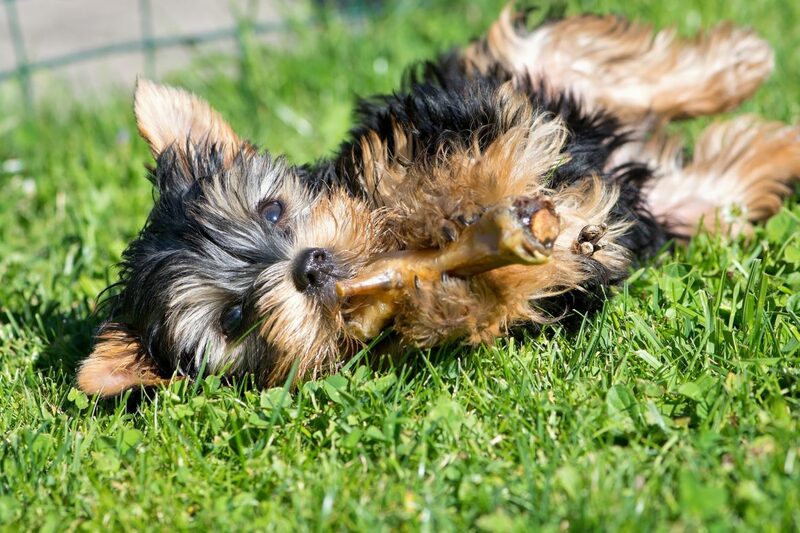 Teaching your puppy to stop eating everything doesn’t have to be a chore. If you’re really stuck, check out our options for online dog training. I can help! Most of the ways to teach your puppy to stop eating everything are game-like. These are good skills for your pup to have anyway. Many puppies simply grow out of this alarming and frustrating stage. But in the meantime, working on increasing her impulse control, increasing exercise, and playing training games will work wonders. I think my puppy became “suspicious” of me today after pulling at least five items out of her mouth over the course of several hours. She started acting fearful and then (scarily) a little aggressive. I like the idea of treating afterwards, but worry my incredibly smart dog might decide to pick up anything & everything in the hopes of getting a treat? Another good question, Cara! You teach dogs to drop it using treats, so I’d always recommend using treats. Using force will only make her more suspicious or even aggressive. Once you’ve stopped the aggression using treats, we can start teaching a “leave it” (also using treats) so that we don’t get into a pattern of constantly picking things up. If you’d like, I can give you help treating your pup’s aggression in a phone call (15 minutes or 1 hour) or through ongoing email support. My 9 month old German Shepherd/border collie mix won’t stop licking / eating everything he can get his mouth on. His training has been limited as well as difficult because He is 1 of 3 littermates in my household and the distraction of the others is difficult enough to get passed. I also work long hours most days of the week. Where do I start with training to make them better with such limited time and energy. Hi Chelsea! It definitely sounds like you’ve got a lot on your hands with three adolescent, high-energy, working dogs. I’d recommend getting help exercising and training these dogs ASAP, or things are likely to get worse. These are smart, working dogs that need LOTS of physical and mental activity every day. My 6 month old Pitbull eats everything, she goes outside in the yard with the other dogs and the kids and she eats trash, rocks, sticks, bugs. In the house she eats shoes, stuffing out of her toys and the sofa. Her poop is always full of stuff. She had had loose stools for a day and this morning she puked up a plastic bag full of leaves and twigs. Please help!! Hi Cherie! That sounds pretty serious. I’d recommend getting a comfy basket muzzle so that you can keep her from eating things if you’re not around to watch. I’d also try to pick EVERYTHING up and give your puppy more mental stimulation and stuff to chew on. She might just be looking for something to do and/or enjoy the attention. That said, Pica is also a serious ailment that you should talk to your vet about as well.